Help! For Writers - Audiobook | Listen Instantly! The craft of writing offers countless potential problems: The story is too long; the story's too short; revising presents a huge hurdle; writer's block is rearing its ugly head. In HELP! FOR WRITERS, Roy Peter Clark presents an "owner's manual" for writers, outlining the seven steps of the writing process, and addressing the 21 most urgent problems that writers face. In his trademark engaging and entertaining style, Clark offers ten short solutions to each problem. Out of ideas? Read posters, billboards, and graffiti. Can't bear to edit yourself? Watch the deleted scenes feature of a DVD, and ask yourself why those scenes were left on the cutting-room floor. HELP! FOR WRITERS offers 210 strategies to guide writers to success. Download and start listening now!
" Nothing ground breaking. It focuses mainly on nonfiction writing; however, it does cover some useful tips for fiction writing. " " was inspired and picked up some good tips for fiction and non-fiction books! " " Meh. Whatever. Offers obvious advice and suggestions. I got bored, starting skipping around and finally returned to the book I'm writing. It'll be a classic, it'll sell more copies than the Bible and will make me immortal. I kid. Seriously, though, there are better writing guides out there. " " Interesting combination of his first two books. Certainly more in depth and easily understand, I can't wait for the next book he is working on. " " Roy Peter Clark, though I've never met him personally, is amongst my very favorite teachers. His books, including this superior volume, have taught me more about writing than any other teacher I have ever known! " " Some useful tips in here, but a lot of repetition. Also, the author seems to have tried to cater for all kinds of readers across the book, but ended up with many of the tips that are relevant only to certain specific types of writer. " 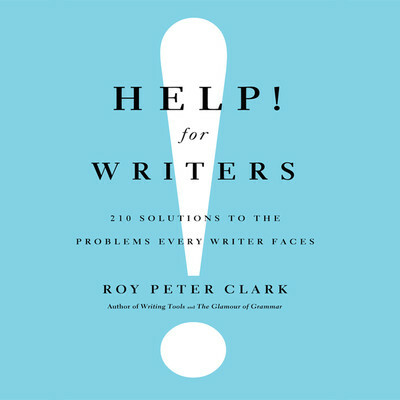 " Every writer who takes his/her work seriously needs this book. Some repetitive components with "Writing Tools" and "Glamour of Grammar," but that's a small criticism. Go get Help! " Roy Peter Clark is vice president and senior scholar at The Poynter Institute, one of the most prestigious schools for journalists in the world. He has taught writing for more than thirty years and has spoken about the writer’s craft on The Oprah Winfrey Show and NPR. A writer who teaches and a teacher who writes, he has authored or edited a number books about writing and journalism, including Writing Tools and The Glamour of Grammar. He lives in St. Petersburg, Florida.